For Bethany Hollman, a study abroad trip this past summer to Botswana was an inspiration, but it turns out, it also earned her accolades at home. The School of Natural Resources fish and wildlife major recently won the Art Alley category of the Education Abroad Photo Contest hosted by the University of Nebraska-Lincoln. 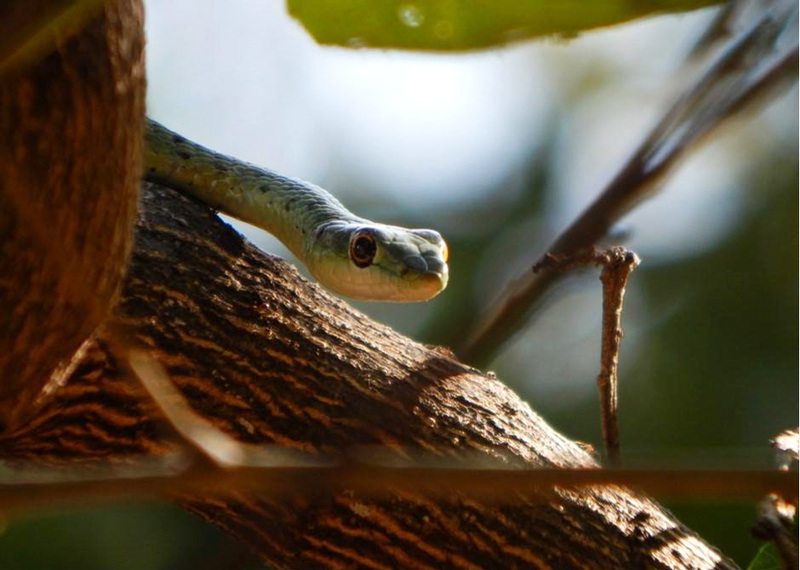 Her photo shows a bright green snake slithering down a branch and peering into the camera with one yellow-rimmed eye. Art Alley, the catch-all category where individuals should show their creativity. Initial judging was conducted by selected Nebraska faculty and staff members, and entries were evaluated on appeal, content and presentation of the education abroad experience. Three finalists from each category were chosen and then voted on through Nebraska social media channels. The winners were announced Sept. 27 at an Education Abroad Returnee Ice Cream Social. Cat Berrick, fisheries and wildlife major at the School of Natural Resources, has been selected to receive a $4,000 Shikar Safari Club Scholarship from the Texas Game Warden Association. The scholarship recognizes high-achieving students currently involved in the studies of wildlife management, range management and law enforcement. High achiever might be an understatement. Berrick, who has completed a UCARE project on Northern Long-eared Bat Activity, also is a Cabela’s Apprentice and has worked wildlife and fisheries management jobs over summers. In her last year of school, Berrick is shifting her focus from wildlife conservation to fisheries. The scholarship is given annually to students studying wildlife ecology or range management who have a pro-hunting point-of-view. The Shikar Safari Club Scholarship is awarded annually to undergraduate and graduate students. Recipients must be active hunters with a minimum 3.0 GPA and good leadership abilities. After she graduates, Berrick hopes to pursue a master’s degree, possibly at the Universidad de Castilla-La Mancha in Toledo, Spain. Given her current record, she'll likely achieve that goal, too. Larkin Powell, professor at the School of Natural Resources, earned the CASNR Fellow award Oct. 19 at the ninth annual honors banquet at the East Campus Union. “This year we recognized Dr. Larkin Powell for his excellent contribution to the cause of undergraduate education, especially in the area of undergraduate research over the past many years,” said John Carroll, SNR director, and Tiffany Heng-Moss, dean of the College of Agricultural Sciences and Natural Resources. The award was instituted in 2009 and has been given out annually since. The nomination for the award is made jointly by the assistant director and CASNR Liaison to the University Honors Program, currently Dr. Madhavan Soundararajan of the Department of Biochemistry, and the dean of CASNR. Previous recipients included, Dr. Jim vanEtten, Dr. Steve Baenziger, Dr. Merlyn Nielsen, Dr. Laura Damuth, Dr. John Markwell, Dr. Patrice Berger, Dr. Rita Kean and Dr. Angela Pannier.